Sun Cellular is now offering flagship phones for its postpaid plans. Its latest offer is no other than the android royalty itself, the Samsung Galaxy S III. You can get this free at Plan 1699. The Galaxy S III is the best phone in the market as of this writing. It runs in 1.4 GHz Quad-Core processor with the sparkling 4.8-inch display. It comes with Ice Cream Sandwich out of the box but expect to have Jelly Bean for this monster-phone. The plan is bundled with Unlimited Internet courtesy of expanding Sun-slash-Smart network, unlimited Sun to Sun text, 4 hours of Sun to Sun calls and 250 SMS to other networks. The plan’s breakdown is Php 999 to unlimited internet and Php 700 as monthly amortization of the handset with 30-month lock-in period. 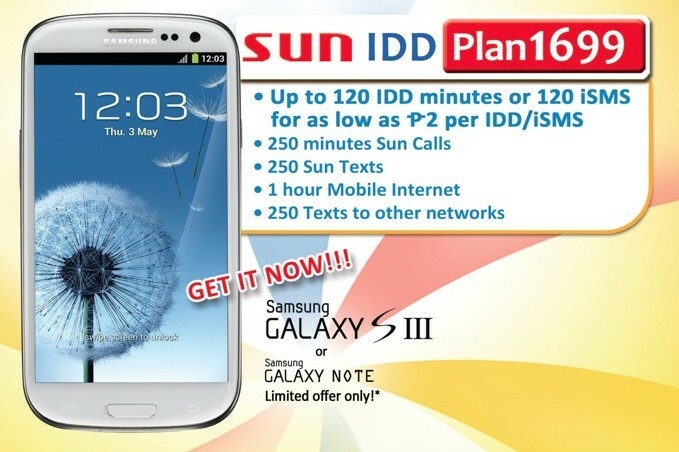 Aside from the regular services, you can also avail up to 120 IDD minutes or 120 iSMS for as low as Php 2 per IDD/iSMS. You can also opt to choose a Galaxy Note instead of the Galaxy S III.